Based on your comments, I would say that shelf by shelf is going to be a popular feature. I was surprised to see at least four people commented that they don’t keep their shelves in alphabetical order. That surprises me more than a little. Are they just all higgedly piggedly? Is it because I have mild OCD that I put mine in alpha order? Is it because I worked at a library in my formative years? I was actually kind of embarrassed about my shelves because they may be in alpha order by author, but they are not in alpha order by title by the same author. Thus my Atwoods, as you are about to see, are not in alpha order. Prior to moving out for our house renovation I always kept them in title order within author. Somehow I just haven’t gotten around to it since we moved back in. The other challenge I face is that when I own the entire output of a single author, my temptation is to put them in chronological order. You will see what that looks like in the coming months. I don’t want to give away too much of what is to come, there are some anomalies for sure. But I will answer Liz Dexter’s questions: 1. In general my fiction is separate from my non-fiction. 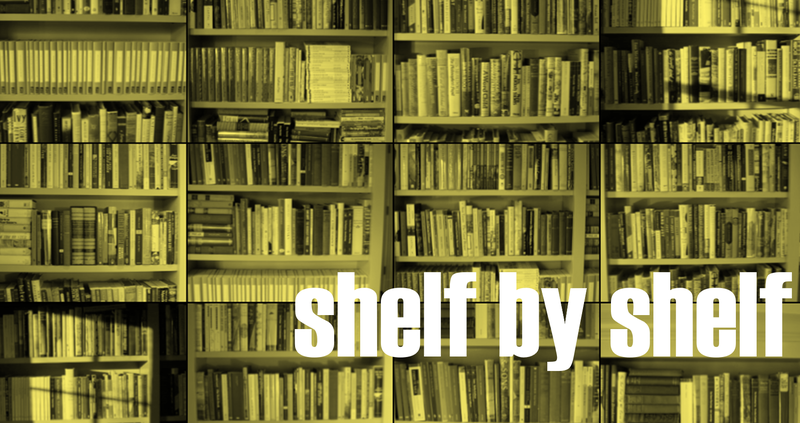 About 7 of the 35 shelves will be non-fiction. 2. Of course I keep some of my TBR books in various places in the library and next to my bed. But, most of them are intershelved with their brethren and sistren (I don’t think that is a word) that have already been read. (I realize that not all of these are fiction.) For a long time The Robber Bride was my favorite Atwood, now supplanted by the MaddAddam trilogy. Very different books indeed. Now that I have a bit of a penchant for vintage sci-fi, I am quite curious to re-read The Blind Assassin for it’s sci-fi novel within a novel. Handmaid’s Tale will be considered a classic until the end of human life. A few of you mentioned loving Alias Grace. My best friend would agree with you, but it is actually my least favorite–and I have read it twice. And, in case you don’t see them here or in the previous shelf by shelf, I have read all of Atwood’s fiction, I just don’t own them. Auchincloss come from old New York money. I loved The Book Class and look forward to reading the others. As a loose rule I don’t keep easily obtainable classics, not enough space in my library for that. The only reason I keep this great old Signet edition is that I love the cover. I’ve read far more of Auster’s work then the one you see in the list above. Sunset Park and The Brooklyn Follies (which I loved), fall into the straightforward, easy-to-read Auster. Others of his, like Man in the Dark, while enjoyable, take a bit more effort. For some reason I think I like Beryl Bainbridge yet I’ve yet to read anything by her. I think I have a few more of her books floating around the house somewhere. I bought this one solely for the title. I have since learned that Baird was born in England but emigrated to Canada in 1919 and wrote a seminal novel about Canada in the Depression (but this one ain’t it). I’ve read these at least twice each. Baldwin is a master that deserves even more praise than he gets. I’m not a universal fan of Julian Barnes’s work, but I really did love this novel. Brilliant, sad, and deep. I’ve read Gourmet Rhapsody and it didn’t bowl me over so much that I immediately went and picked this one up. I think I also got tired of seeing its ubiquity in the blogosphere a few years ago. I guess I am waiting until it is vintage. Got this as a gift from some UK friends. It seems to be a sort of coming of age memoir/novel with Maggie Thatcher somewhere in the background. I watched the film version of this novel in my college Italian class and I think it may be in that giant 1001 Books You Must Read Books Before You Die book. When I saw this somewhat beat up copy I had a very strong desire to reacquaint myself with the story of the family of Jews in Italy during World War II. At least that is what I remember. Next Article Whatever happened to these new books? My shelves are all higheddly piggedly and I did volunteer in my high school library for at least a couple of years. Mostly I don’t have enough space and my books are three deep. My husband is remedying for me as he is building book shelves to line more of our living room. When I get to reorder them, still not sure I will be able to put them in alphabetical order, but it is a thought. Mostly I blame you, Simon, Gav, Ann and Michael because before I discovered your podcasts my TBR and book shelves were much fewer in number. Except in one area, somewhere around shelf 20, I haven’t done any doubling up. You should keep a separate pile for each of us podcast book pushers, read them all, and then report on which of us you are most in sync with. That would be fascinating. Love this Thomas. Thanks for sharing. I’m loving this series – nothing quite like being able to look in detail at someone’s shelves and to get the background detail as to why particular volumes are there is wonderful. I’m always disappointed when visitors don’t look at my shelves so it’s nice that you all are liking it. I too [Jonathan writing] have elements of autism and OCD, and that has in the past (I’m now retired) helped my work as a civil engineer in a highly technical specialism. However I also have something of a split personality, the other side of me is more creative and delights in spontaneity and randomness, something that I value in a rational way (rather ironic that). I consciously fight my tendancy to organize everything to the nth degree, because I know it is narrowing and destructive. But back to books! Glad to see Bery Bainbridge. I have had a negative reaction to Julian Barnes, but as you clearly think The Sense of Ending stands out, I’ll look out for it and give it a try. Looking forward to next instalment!! The only other Barnes I have liked is Arthur and George, but I find The Sense of an Ending to be in a different league. In some ways it reminds me of Ian McEwan’s On Chesil Beach. So although that’s freaking me out, brace yourself because my shelves aren’t in alphabetical order, or even any order with regards to fiction/ non-fiction. But they are in an order that I understand. I put books together based on similarities that only I see – sometimes because I read them around the same time, sometimes a theme, sometimes because the covers match… It’s random, I know (and best expressed through my #6Degrees meme). You made me laugh. I keep an Excel spreadsheet of all the books I have read so I don’t necessarily have to remember which on the shelf are still TBR. I like intershelving them because it allows me to browse my library as if it were a real library or a bookstore. You’ll see some visual organization practices when I hit my Persephone shelf and my small book bookshelf. I love this – an organization system that makes sense only to you, like it’s a secret code! I would want to stand there and try to figure it out, like cracking the code. I was looking for a book for a friend once and said “It will be on the shelf next to X…” And she asked why and all I could answer was “It just feels right…” 😂 But that’s the ‘system’ (lucky I don’t own a bookshop or work in a library). I’m a librarian but my bookshelves are not in any particular order – though I think books by the same author have at least found each other. If I decided I would organize them, I would probably heartily enjoy it. However, I think I need another bookshelf to pull it off. I’ve got one bookshelf that has books stacked behind books and another bookshelf where books are in rapidly growing piles on top. I zoomed on the image before reading and was going to tsk you about the single Austen, but your explanation makes sense to me. I really need to read some James Baldwin. I thought I had a Paul Auster on my to-read list but I don’t. I’ll put The Brooklyn Follies on there. I do love to organize things and books probably most of all. It’s like a pastime in itself. The Brooklyn Follies is eminently readable. Oh and I always debate on if I should do alphabetical or publication date when it comes to an author’s works. Unless it’s part of a series I think in general I stick with alphabetical. Upon reflection, I think my complete works of Pym and Brookner might be the only two have gotten the chronological treatment. In the case of Pym I can’t even say publication date. Because of her somewhat unique publishing history some of hers were published wildly out of sequence. Love this series. Thanks for the peek in to your library! Ruth, I feel like you are bringing shame down upon me. After about 90 pages I gave up on A Brief History of Seven Killings. I like that sistren is a word though. No shame! Life is short and there are plenty of other great books out there. But if you want to give it another go, try going via audio for this particular title. At least that is what I did to get me started and used to the rhythm of the Jamaican entries. Then I read the rest using my eyes. Thank you for the clarifications! I am going to have to count my fic and non-fic shelves now, but the non-fic way outweigh fiction. Eeps. I shelve the works of an author in chronological order except where a series was written out of order but has to work in a certain way. My fiction is by author surname, with short story collections at the end, but my non-fic is divided ino biography, travel, sport, but then also “quest” (Danny Wallace and Dave Gorman and that book about becoming a Scrabble champion) and other such. And sometimes by size. So those will be fun. As I desperately try to make room for more fiction I sometimes eye my non-fiction and think about liquidating it. Thankfully I have managed to stop myself from doing that. I’m bad bad bad, Thomas! No alphabetical order for me either. Maybe it’s a subtle rebellion after working in school libraries for many years. I do group authors together and one of my bookcases is dedicated to Art books. I’m a former art museum docent and have an extensive collection of those. I don’t own anywhere near the number of volumes you do and suspect if I did I would eventually drink the alphabetizing kool-aid! We do have a section of large format books on art and gardening and such, but I hadn’t considered making that a part of this series because most are John’s. I am a very shambolic person but classifying my books is the only kind of tidying I actually enjoy ! They are shelved in the following order : country of origin of the writer, century, year of publication and finally alphabetical. I should add that I cannot abide alphabetical order in bookshops. I said so to a bookseller the other day after seeing Marc Levy sitting smugly next to Primo Levi ! It seems that they do not wish to discriminate between different types of literature but to me it’s only confusing. I would very much like to have your opinions on the subject. Oh my goodness. I think your system would make me a little crazy. Would you put US born Canadian writer Carol Shields under the US or Canada? For a short time there was a wonderful travel bookstore here in DC that had fiction about various places mixed in with travel writing and guide books about those places. I loved that approach. I found The Lost Honor of Katerina Blum that way. I love that book. Great series, Thomas. I look forward to this tour through your library (I too love peeking at other people’s bookshelves, in ads, magazines, online, etc). In the book room here at home I have fiction a-z, and a big section of memoirs/collected letters/diaries/biographies (mostly British) a-z. Poetry also a-z. Other sections are by subject, and not enough within each subject to alphabetize, so I arrange by subtopic or, um, by color. I really love groups of old clothbound and leatherbound books, shelved at eye-level, where they can be most easily appreciated. Sarah, our method sounds identical. I gotta agree with Kate W – *mixing* unreads in with the reads?!? If I did that, some books could potentially get lost forever. I have separate shelves in my bedroom for all of my TBRs. They don’t leave my bedroom (or get input into the household library software for that matter) until they are actually read – in case I don’t end up keeping them. Then they get shelved in the appropriate room in the house alphabetically by author within subject. I do have a few exceptions like you do with Atwood where I shelve either in publication order within an author, or chronologically with a series, etc. Well that’s just it there is no proper way. Just the way that makes sense for each of us. What fun – I love looking at people’s shelves! And I totally agree that Baldwin is amazing and needs to be read more – every work of his I’ve read has bowled me over. Now, onto the good stuff: shelf organization system. I simply cannot do alphabetical, though I absolutely do need organization (disordered and random shelving makes my skin crawl). My method of organization is chronological within geographical regions — so chronological from date of publication of first book I have by an author (then all the author’s works together) within Britain, W. Europe, Russia, Japan, etc. For me, this is the only way to make sense of the literary context in which a book was published (and the only way for me to find things, since this is clearly how my brain is organized; I should note that I am a professional historian, so this kind of categorization is part and parcel of my professional life). It means nothing to me that David Copperfield be shelved before Middlesex just because one author’s name starts with D and the other with E. But it does tell me something interesting to note that Graham Greene started publishing before Samuel Beckett. I could imagine doing away with the geographical units (which, as we approach the contemporary period, becomes increasingly meaningless, what with globalization, post-colonial literature, and migration) but I could never do away with the chronological organization. I’m surprised at the popularity of the geographical organization, something that would never occur to me to do at home. Yeah, I was happily surprised to see someone else in the comments say that they do it too – but it’s cool only because it’s what means something to us. It makes sense to me because I think about books in terms of historical/literary context; not everyone has to think that way. And what’s awesome is hearing about other people’s organization systems that make sense to their brains – we each want something different from the way we read AND the way we shelve our books, and that’s so neat.